Are you in Paris? Do you understand French? Are you looking for an entertaining way to spend the evening? If you answered "yes", GO see "Dernier Coup de Ciseaux", the uproarious whodunit comedy where the audience helps solve the crime - I promise that you won't regret it! Adapted from "Shear Madness", an American play seen by over 9 million people around the world, the spectacle is a delightful mixture of improvisation and up-to-the-minute humor set in a hairstyling salon in the Marais. After being thoroughly delighted by the original version in Boston, Stéphane and I couldn't wait for the opportunity to repeat the experience and were pleased when a visit from our niece and her boyfriend provided us the perfect excuse to go to the theatre on Saturday evening. The audience is invited to share their theories about who committed the crime with the detective (wearing a black shirt and glasses in the middle of the photo) during the intermission. Not only did we have a wonderful time, but I learned something new about Parisians. They're spontaneous, witty and funny. Since I don't want to give away too much about the performance, let's just say that audience participation is completely optional but that there were a surprisingly large number of wannabe detectives whose interactions with the cast members were hilarious. 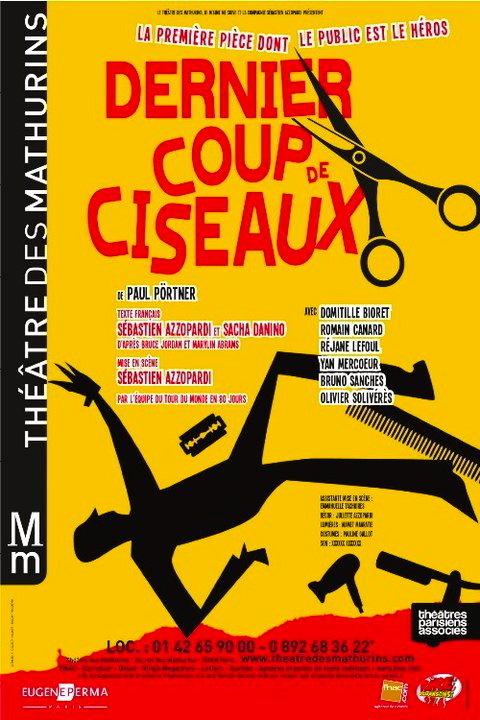 Due to its overwhelming success, "Dernier Coupe de Ciseaux" has been prolonged at Théâtre des Mathurins until the end of the year. It has received an 84% "Bravo" rating from 859 spectators. Click here to read the reviews in French. After the show, we strolled across the Seine to have dinner at FL Restaurant, which is currently the number one restaurant in Paris out of 8,056 listed on Trip Advisor. Working in an open kitchen visible from the cozy dining room, the young Picardian chef artistically prepares and plates each dish. Reasonably priced, FL Restaurant is a very good option for dinner, especially since it's located on a small street near the Eiffel Tower. Walking under the sparkling structure on our way home was a splendid way to end our Saturday night out in Paris. The homemade foie gras (14 euros) served with toasted brioche was possibly the best that I've had in Paris. Just to be sure, I think that I'll have to try it again in the very near future! While my swordfish with quinoa and sweet potato puree (20 euros) was very tasty, it has been a long time since I've seen Stephane so pleased with the preparation of his steak. It was cooked to perfection. And who can resist chocolate in three different forms for dessert? Certainly not me! LOVE the melting chocolate mess! Goodness! Is that the entirety of the kitchen? How many seats are in the restaurant? And a stroll under the Eiffel Tower at night is pure magic. What a great night it must have been. I'm fairly sure that's the extent of the kitchen, although there may be another area in the back where a sous-chef prepares some of the food. There are 26 seats in the restaurant and I have to say that I was amazed by the calmness of the chef. Everything arrived at our table in a timely fashion and was presented in a pleasing manner. It was a really great night - with the Eiffel Tower as the icing on the cake! Oh I wish him well. I love small restaurants like that.